See our selection of Award Certificates in a huge number of subjects. 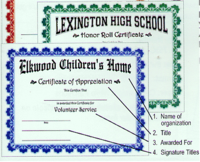 Each award certificate measures 8 1/2" x 11". Large quantity discounts. Fast same or one day shipping! Unique certificate designs in full color. Perfect for all of your team members! School Subject Certificate AwardsChoose title, color and more! Stock and custom covers. Top quality, perfect for schools! Large quantity discounts. Choose from gold or color finish. Yes, they are really free! Just download and print! Custom CertificatesSelect border, print colors, font and more! Colorful and fun! Quick 1 day shipping. 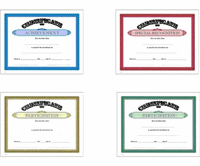 Our colorful school certificates and templates are sure to be a hit with your students. Find titles for honors, math, science and many more. Of course, we carry sports certificates as well. For those on a tight budget, TrophyCentral has FREE CERTIFICATES - perfect when you only need to print one or two.